Spaghetti carbonara is one of my favorite pasta dishes. I love the flavors of bacon, egg and grana padano cheese combined with a good quality spaghetti. Also, having “breakfast for dinner” in spaghetti form is always a pleasure. This is a nice spin on the basic carbonara. The brussels sprout leaves are cooked until crispy and charred before tossing in the pasta. This recipe was featured in the latest issue of Bon Appétit. It was stated “the key to this dish is getting a good char on the brussels sprouts, which helps balance the richness of the porky, eggy sauce. Salt draws moisture out of the leaves, which might make them soggy, so do not season them” (while charring in the skillet). I found by removing the outer leaves first then carving out the core a little I was able to easily separate most of the leaves from each sprout. Using a good quality pasta will made a difference in the outcome of your recipe. Heat 2 tablespoons of the olive oil in a large skillet over high heat. Working in batches , add brussels sprout leaves and cook, tossing occasionally, until charred in spots and crisp tender, about 5 minutes. Transfer to a plate and set aside. Cook pasta in a large pot until al dente. Drain, reserving 1 cup of the pasta cooking liquid. Meanwhile, heat the remaining 1 tablespoon of olive oil in the same skillet over medium heat. Add guanciale or pancetta and cook, stirring often, until slightly crisp, about 4 minutes. Add pepper and cook, stirring until fragrant. Immediately add 1/2 cup pasta water, reduce heat to low and gradually add butter, swirling skillet and adding more pasta water as needed, until a tick glossy sauce forms. Add pasta to skillet and toss to coat. Add Pecorino, toss to combine. Remove from heat, mix in egg yolks. Add brussels sprouts leaves and toss. You may need to add a little more pasta water to thin sauce. Serve pasta with more Pecorino. I have a brussel sprout and chorizo pasta recipe which uses them whole, I think I’ll have to give this one a try as it looks delicious. Sprouts get really bad press but I adore them. Your pasta recipe sounds great. I would love them whole in a pasta too. I adore them too. Couldn’t stand them as a child though. I like brussels sprouts–this sounds like a great way to use them! Brussels sprouts are at the top of my list! Although this is a bit more time consuming as far as prep work, it really is worth it. A wonderful twist on a carbonara. Thank you! This is lovely. I am sure the charred Brussels sprouts must have really added something to the carbonara; my boyfriend would love this! When the season comes (it is still a bit early), I usually have too much to know what to do with them; now I will know! Good idea for brussel sprouts. Yum! Love seeing sprouts being given makeovers – they are a big favourite if mine! Ha! This is considered a make-over! My favorite is pan fried in olive oil for sure…but this was nice for a change. Looks delicious. Nice looking post. What a creative approach to a traditional dish. I bet the charred brussels sprouts added a wonderful depth of flavor to the dish. Very nice, indeed. You are right! I love carbonara and adding the brussels sprouts did add a nice flavor which matches well with bacon and pecorino. My family loved it! Ha! Thank you Sophie. Too bad we aren’t neighbors…we could share! This looks lovely. The colours are excellent and the sprouts, I’m sure were tasty. Though, I detest them myself. Haha! Yes it was the way our Mum’s cooked, nothing odd just accepted style, I loathed cauliflower too, but now I love it! “…guanicale (salt-cured pork jowl)” you taught me something new. Thank you. Hope I can remember the name. i’m gonna have to agree with conor on this one. this dish, to me, is all about those colors. beautiful. Ha! Skewing sprouts?! Amazing. I’ve never thought to do that and I love the idea. I’m going to give this a go for sure! And I am beginning to realize you are very fond of eggs. :) I can just imagine grilled skewered brussels sprouts, basted with butter…..
Love carbonara and that you added the sprouts, yum, what a great idea. Looks totally delicious! Thank you Suzanne. Yes…the sprouts really changed it up a little. We loved it. 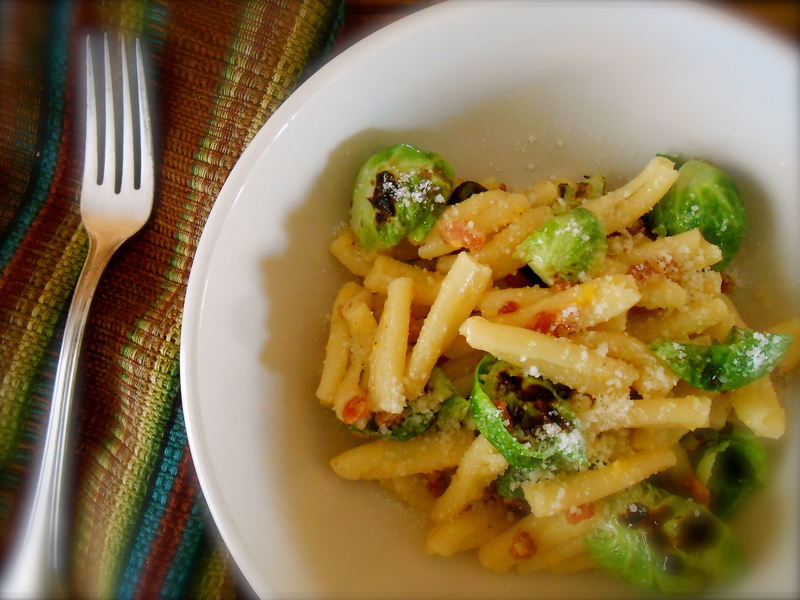 never though of combining brussle sprouts with pasta! What a fabulous combo!! Thanks Lisa! Very subtle and delicious. Brilliant to put Brussels sprouts in pasta. I love this type of dish! You had me at ‘porky eggy sauce’. I absolutely love a good carbonara, especially one laden with pecorino (one of my all-time favourite cheeses). The brussels sprouts are an inspired addition. Yum! Carbonara can certainly stand alone. However, the brussels sprouts were fantastic, especially using the tiny little thin leaves. Awww and pecorino, I love it too. We have brussels sprouts in the fridge!! 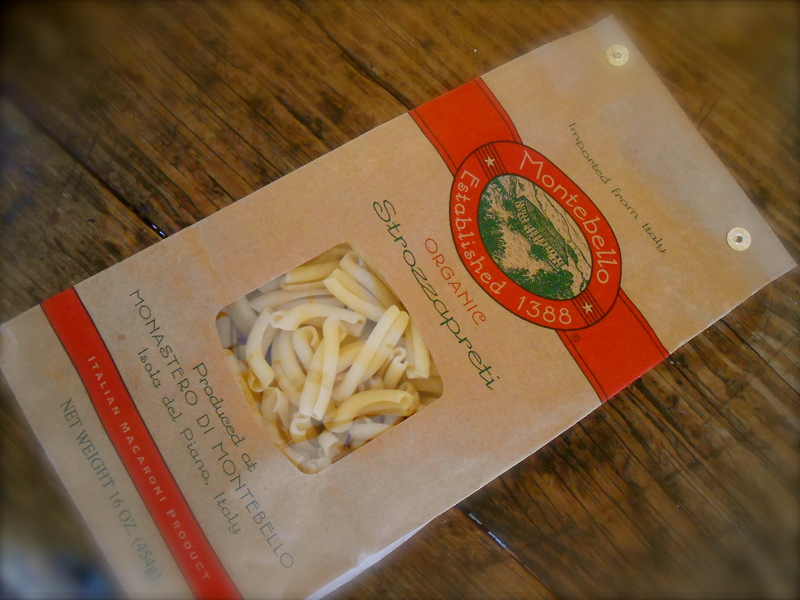 I really want to try this one– it’s turning into pasta weather here. thanks. OH good! Hope your have a chance to use some for a carbonara pasta! It is so wonderful, you’ll love it. This dish looks delicious! Great job! love how your Brussels sprouts are charred, but not olive green. Now THIS is how they’re meant to be cooked :-) Great recipe! Took years for me to enjoy brussels sprouts. It’s all about the cooking when it comes to these. My mom boiled the life out of them. I love them as long as they are pan fried in a little olive oil….or butter! And yes, charred too. Thanks Liz…you are always so kind with your comments. Oh yeah! Bacon Jam! 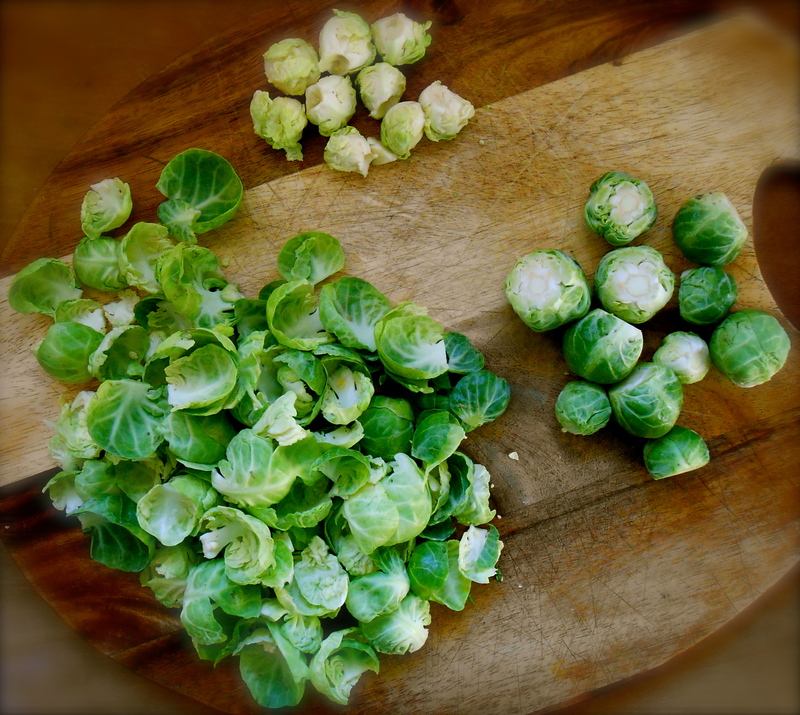 :-) Here’s where I’ve been with the Brussels sprouts: http://wp.me/p2dvv9-JP Thinking you’d enjoy. Definitely not a kid-friendly veggie. Perhaps a touch of bacon jam would go especially well with Brussels sprouts? I’m betting yes. This looks like such a comforting and delicious pasta dish for the season… I don’t make pasta often enough. I find that when cooking with brussels sprouts, it’s all about the char! The texture of them makes such a difference, and it looks like you nailed it here. I think I make enough pasta for both of us! :) I’m so fond of brussels sprouts and I agree, charring and cooking the heck out of them is best. I wish you were cooking my dinner. Honestly – I love every single thing you cook and post. Your blog is like coming home. And I love both carbonara and brussel sprouts – a brilliant combination. :) You are so kind. It would be my pleasure to cook dinner for you! Thank you so much for all your thoughtful comments… I’ve been out of the loop for a few weeks, work has me so busy these days, need to catch up! Last week was a real dud as far as dinner goes around here. I think four nights went by and I didn’t even turn on the stove. My poor son, I think he had hot dogs for dinner twice last week! :( And what about your weather? Inches and inches of rain here! Coyotes? I love it! Seriously…monsoon here! I loved your post today. I am going to make your shortbread cookies for sure. Its great to find another brussel sprouts lover. Sadly our season is all but finished. Love the idea of separating and charring the leaves. and of course carbonara is already a firm favourite. Aw yes! I do love brussels sprouts. Our season is just beginning. :) Nice to hear from you…. Perhaps we’d enjoy brussels sprouts more if they were charred. They look great! Thanks. I’m discovering not many share my love for these little cabbages…they are cabbages, right? I love the idea of carrbonara with brussels sprouts. I can eat a big bowl of this. :) Delicious! You are currently reading strozzapreti carbonara with charred brussels sprouts at COTTAGE GROVE HOUSE.